Located half a mile off Interstate 95, this Ashland, Virginia motel is 10 minutes’ drive from Kings Dominion Amusement Park. 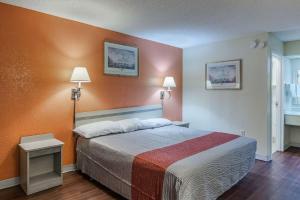 It features cable TV with extended channels in every guest room. 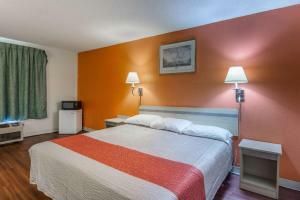 Motel 6 Ashland Virginia has rooms with a desk and free local calling. They are simply decorated with soft colours, light wood furnishings, and carpeted flooring. Wireless internet is also accessible. Guests can relax on the poolside sun terrace at the Ashland Motel 6. Copy and fax services are provided at the 24-hour front desk. Coffee is offered every morning in the motel lobby. Randolph Macon College is less than 1 mile away. Richmond city centre is 17 miles from the motel. This room features cable TV and desk. 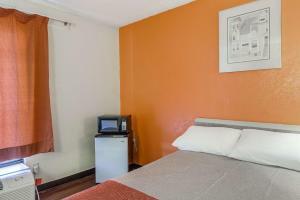 Rate: US$ 45.99 ... US$ 64.70; select dates below to get current rates.